DJI has announced the Mavic 2 Zoom, which includes a 2x optical zoom lens (left), and the Mavic 2 Pro, featuring a 1-inch type CMOS sensor (right). 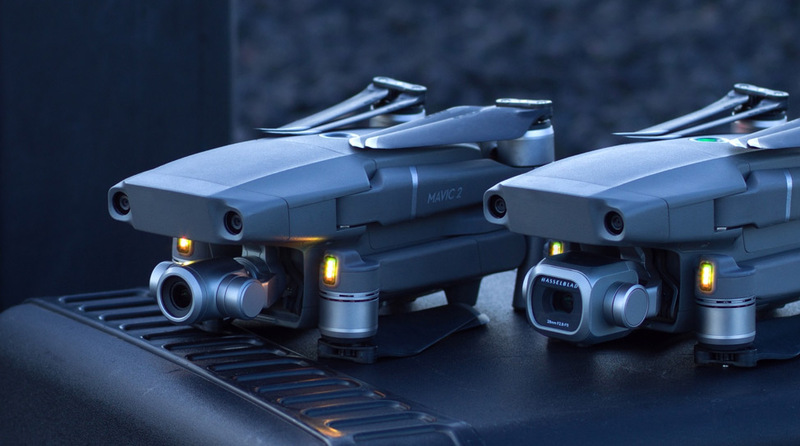 Drone manufacturer DJI has announced the arrival of two new drones to its Mavic series: the Mavic 2 Pro and the Mavic 2 Zoom. The Mavic 2 Pro is the first drone with an integrated Hasselblad camera—a project that the companies collaborated on for the last two years. The Mavic 2 Pro utilizes a newly redesigned 1-inch CMOS sensor and 10-bit Dlog-M color profile, which allows the Mavic 2 Pro to capture four times the level of color as its predecessor, the Mavic Pro. The drone can shoot 20-megapixel images, has an ISO sensitivity of 100-6400, an aperture range of F2.8 to F11 and shoots 4K video with 10-bit HDR. The Mavic 2 Zoom is the first consumer-oriented drone with zooming capabilities. It offers users a 2x optical zoom (24mm-48mm) and a 2x digital zoom (49mm-96mm) and can capture lossless video in full HD resolution. It’s built around a redesigned 1/2.3-inch CMOS sensor, can shoot 12-megapixel images, has an ISO range of 100-3200 and improved focusing speed thanks to its upgraded phase and contrast detection. 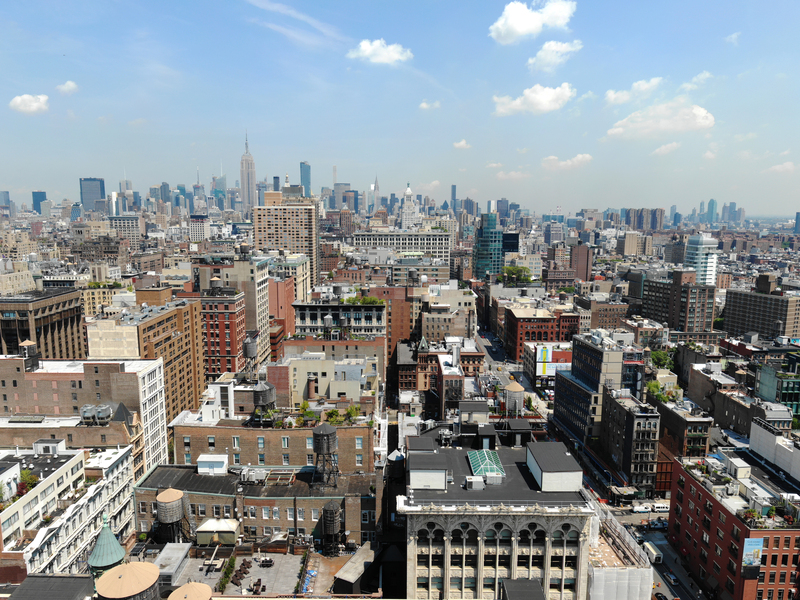 A new auto mode on the Mavic 2 Zoom, called Super Resolution, uses the drone’s optical zoom to shoot nine individual images of a scene and then automatically stitch them together into a 48-megapixel photo. The drone’s zooming capabilities have led to new video modes too. Dolly Zoom QuickShot allows videographers to quickly replicate cinematic techniques popularized by folks like Hitchcock, where the camera zooms in on a subject while moving backwards. The bodies of the two new models are identical, and are slightly larger than the original Mavic Pro; like the orginal, they also fold down for easy transport. Both are equipped with omnidirectional sensors that can track the drone’s movements left, right, up, down, forward and backward, utilize a 3-axis mechanical stabilization and feature new auxiliary lights on the bottom to help with landing and flying in low-light situations (like dusk and dawn). A redesigned winglet and new motors make the two drones quieter than earlier models. Both models can record at a maximum bitrate of 100 Mbps using H.265 compression, include 8GB of internal storage, and can capture 4K video at up to 30fps as well as HD video up to 120fps. Each has a respectable flight time of 31 minutes. The new drones also feature updated intelligent flight modes like Hyperlapse and ActiveTrack 2.0, which can now avoid obstacles and continuously track subjects thanks to the 10 sensors found on each drone. OcuSync also gets an update and help keeps the controller and the drone in communication—the Mavic 2 drones can transmit 1080p video up to five miles away from the controller. The Mavic 2 Pro will retail for $1449, while the Mavic 2 Zoom will retail for $1249. Both models are available today from DJI. August 23, 2018 – DJI, the world’s leader in civilian drones and aerial imaging technology, today introduced a new era for camera drones with two additions to its iconic Mavic series: Mavic 2 Pro, the world’s first drone with an integrated Hasselblad camera, and Mavic 2 Zoom, the world’s first foldable consumer drone with optical zoom capability. The US retail price of a Mavic 2 Pro, including the drone, battery, remote controller, charger, and four pairs of propellers, is $1,499 USD. The US retail price of a Mavic 2 Zoom, including the drone, battery, charger, remote controller and four pairs of propellers, is $1,199 USD. A Fly More Kit, including two additional batteries, a multi-battery charging hub, a car charger, a battery to power bank adapter, two pairs of propellers and a carrying bag, retails at $319 USD. A gimbal replacement service exclusively for Mavic 2, will be available soon.